Marquardt N2O4/MMH rocket engine. Developed as attitude control thruster for the Apollo Service and Lunar Modules in 1960s. In production for numerous satellites (Leasat, Insat, HS 393, Milstar, Intelsat 6, Italsat, Eurostar) for apogee / perigee maneuvers, orbit adjustment, and attitude control. Status: In production. Number: 20 . Thrust: 490 N (110 lbf). Unfuelled mass: 3.63 kg (8.00 lb). Specific impulse: 312 s. Height: 0.55 m (1.82 ft). Diameter: 0.28 m (0.92 ft). Developed as an attitude control thruster for the Apollo's Service and Lunar Module. Each unit for the modules employed four quadruple clusters. Approximately 800 were built. 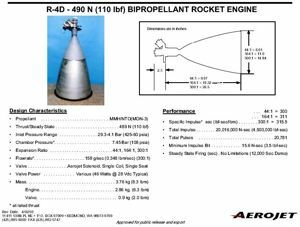 The thruster is currently employed in the R-4D-10 version of the U.S. Navy's Leasat, R-4D-11 by Insat 1 and ArabSat 1, R-4D-12 by HS-393, Milstar, Intelsat 6, Italsat, and Olympus and Eurostar.. Manufacturer: Kaiser Marquardt. Application: apogee/perigee maneuvers, orbit adjust, and attitude control. First Flown: February 1966 (Apollo 201). Number Produced: about 800. Dry Mass: 3.63 kg. Length: 55.41 cm. Maximum Diameter: 27.94 cm. Mounting: fixed. Engine Cycle: pressure-fed. Propellants: hypergolic nitrogen tetroxide and MMH or hydrazine which was pressure-fed at 0.05 kg/sec fuel and 0.091 kg/sec oxidizer at atm. Mixture Ratio: 1.65 (1.0 - 2.4 range). Thrust: 490 N vacuum standard. Isp: 312 sec vacuum standard. Expansion Ratio: 164:1. Chamber Pressure: 6.84 atm. Combustion Chamber: a single chamber/nozzle of welded coated columbium (niobium), radiatively and film-cooled, controlled by an on/off solenoid, and a multiple doublet injector with hypergolic ignition.. Burn Time: up to 1 hour continuous with a 2.67 Ns min impulse bit. Used also in Jarvis-3; IABS. Family: Storable liquid. Country: USA. Spacecraft: HS 381, HS 393, HS 601. Launch Vehicles: Jarvis launch vehicle, Atlas II. Propellants: N2O4/MMH. Stages: IABS, Jarvis-3. Agency: Marquardt.